Oh, how I wish I'd got a better picture of the cake - sorry! This week it was Maisie's 4th birthday. We had the smallest celebration at home with just her best friend and her Mummy - it was really lovely! As it was such a small, informal affair I wanted to make a cake that was small, low effort but high impact. My daughter is one of the fussiest eaters I know, (we have to take a packed lunch to parties now as there's rarely anything she will eat!) but she will eat chocolate fingers and Smarties. She's never eaten birthday cake, so I thought I'd layer it with a tier of chocolate chip muffins just in case. A Kit Kat cake filled with M&Ms... I do feel that the finish of Kit Kats is much neater than chocolate fingers but Maisie won't eat Kit Kats and I just prefer the colour and taste of Smarties. It's pretty straightforward to make - although mine was even simpler than the instructions for the one above. Make a 6 inch Madeira cake. Cut in half and fill with buttercream and jam. Melt about 60grams of chocolate. Spread the melted chocolate on the bottom half of the chocolate fingers with a knife and 'stick' them, one by one, around the cake. I used 2 small packets. Spread a thin layer of melted chocolate on the top. Fill the top with Smarties before serving. 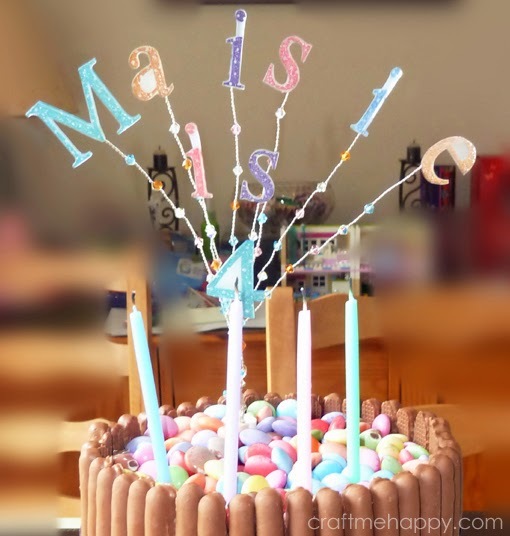 Last year I made a sign for the top of Maisie's birthday cake out of silver plated wire, Swarovski crystals and shrink plastic. So this year, all I had to do was change the 3 to a 4. Luckily, the colours of my Sakura pens that I coloured the shrink plastic with matched beautifully with my cupcake cases and Smarties - you'd think I'd planned it! 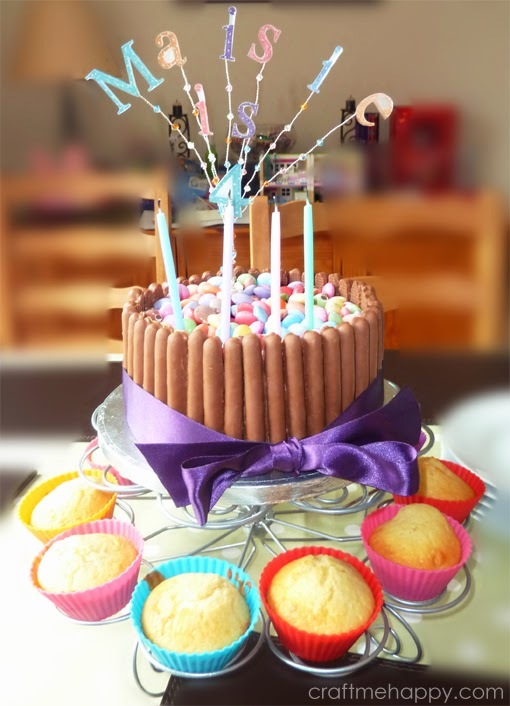 I'm really hoping that this is requested again next year as it's the easiest, 'no skill', 'high impact' cake I've ever made!